Pioneers News · Feb 5 Football Team to be honored at Forest Park Basketball game on 2/12! The Athletic Department will be honoring the 2018 Big 8 Conference Champion Football team at half-time of the Forest Park Basketball game! Come out and help support the Undefeated Big 8 Conference Champs! 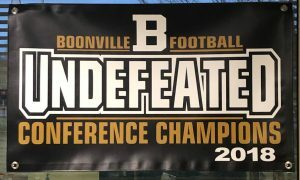 “UNDEFEATED” Banners will be available for purchase. They are $20 each!